Kids today are far savvier than any generation before them when it comes to products and marketing so it's no surprise that Phenix has taken note and gone to school to continue to evolve a line of junior clothing that meets the high standards of today's young rippers. From wildly popular Suku-Suku, designed to grow with the youngest of skiers, to junior Norway World Cup for kids seriously into racing, Phenix is at the forefront of recognizing that today's junior mountain enthusiasts deserve the kind of comfort and performance their adult counterparts demand. Beginning with the 03/04 season, Phenix's junior collection will keep pace with adult styles instead of being a year behind. For juniors demanding the beefiest in performance, Phenix showcases its obsession with technical excellence in the perennially popular Norway World Cup line of unisex outerwear. The junior Norway line, with jackets, pants and suits named for Norse gods, sets the tone for this high-performance collection with a 10,000 mm waterproof stretch fabric, critical seam sealing and a detachable hood for $275. Matching pants in the same fabric with full side zips and removable suspenders are offered at $220. Aerothermo(r), Phenix's proprietary soft shell technology, comes pint sized this year in the guise of the Thor jacket at $185 and Loki race short at $115. 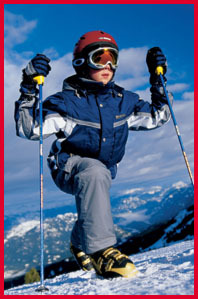 Phenix shows it's all about equality for the sexes this season and that includes the youngest of on-slope trendsetters. To that end, Phenix offers Jewel, a line designed to put a glint in the eyes of girls who already are attune to trendy colors and stylings. The Amber and Sapphire jackets at $165, Topaz salopette at $120 and Alpha pant at $110 offer hot fashion at cool prices. At just $21, the adorable, coordinating Lapis knit hat is a must. The Sonora ($150), Phenix's first Freeride-inspired girls-only jacket and the unisex Atlas cargo pant ($115), would make any jibette proud to strut her stuff at the local terrain park. Freeride junior outerwear utilizes a glossy waterproof breathable fabrics highlighted with a polyester Oxford Stretch fabric. Boys who align themselves more with the freeride movement, have a choice of the red Cronos or black and gray Melek jacket and Atlas cargo pant. The jackets are available with a choice of hideaway or fixed hood at $165. Suggested retail on coordinating seam sealed pants is $115. Freeride, Norway World Cup, and junior editions of the Proline and Performance collections are available from size 6 - 20. For tinier snow monsters - down to size 4 -still on the grow, Phenix returns with its popular, patented Suku-Suku .. With the pull of a hidden drawstring on sleeves and pants, the one- and two-piece suits - or a coordinating jacket and salopette - literally grow with a child and can shrink back down when it's time to hand down to the next up and coming ripper in the family. Designed for two full seasons worth of growth but with built-in durability for much longer, Suku-Suku's eight inches of adjustment are greater than those offered by other makers of grow-along kidswear. Best yet, a set of jacket and pants are easy on the pocketbook, at under $200. Or visit their website phenixski.com .